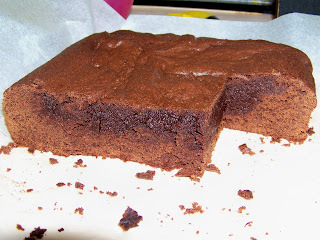 I love brownies ... we didn't have them when I grew up and I can't believe I survived into adulthood ;-) It is a firm family favourite and can be customised in any which way you like. Baking times: it really depends on your oven and just how cooked you like your brownies. I like mine slightly undercooked, so I bake it in a small brownie tin (7x7 in) for 30 min. If you bake it for 40 min it'll be cooked and if you insert a toothpick into the centre it'll come out clean. If you use cornflour, you need to reduce the cooking time by 10 - 15 min as it cooks quicker and can dry out. Oh my goodness I am completely addicted to anything chocolate-y! Thanks for the recipe! That does look delicious. Thank you for sharing.